Every few years, the hands at the Darwin Ranch attend conferences about the origin of life. This is done because they bring along their materialistic presuppositions, ask a lot of questions, then look for materialist answers for those questions. Any success? That'll be the day! Since they have decided to leave the Creator out of the equation, they wind up with a passel of questions on how life began, it's evolvability, how it can emerge from chemistry and physics, and other details. Many questions, many scientists, many views. Creationists can sit back and watch them commence to shooting it out among themselves, and then we can pick up useful refutation material that they use on each other. They cannot get real answers because they start from atheistic presuppositions. 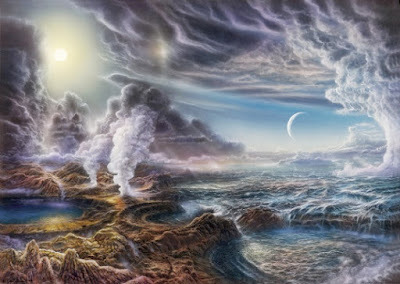 The Origin of Life (OoL) community aspires to discover chemical evolution or abiogenesis. This is the supposed historical, continuous, and naturalistic path from lifeless chemicals to cellular life, encompassing both genetics and metabolism. The gap between their aspirations and their OoL evidence is vast. Recent evolutionist conferences concerning Open Questions on the Origin of Life (OQOL) were held in Sicily (2006), Spain (2009), Leicester UK (2012), and Japan (2014). These conferences discussed possible scientific and philosophical explanations to dozens of vast gaps in understanding the OoL. Scientists can often be each other’s harshest critics. They critique each other’s research and theories by challenging unwarranted assumptions, poor experimental methodology, inadequate data analysis, and unjustified conclusions. We can accept the criticism OoL researchers shower on one another without accepting the incomplete evidence they may provide for their own competing, naturalistic explanations of the OoL. Though I did not attend these conferences, the work presented at OQOL conferences is well documented in the peer-reviewed literature and on conference websites. The OQOL2014 conference in Japan addressed six OQOL selected from among fifteen OQOL by online poll. To read the rest, click on "Open questions on the Origin of Life in 2014".